Yesterday I found myself exploring the Left Bank with a copy of The Scrapbook of Frankie Pratt by Caroline Preston. Recently released in the U.S. by Ecco Books, this scrapbook-style novel tells the story of a young woman who dreams of becoming a writer in the 1920’s. She goes to Vassar College, Greenwich Village in New York, and finally to Paris, where she snags a job with a literary review that just happens to publish James Joyce. This book is like eye candy for anyone who loves Paris in the era of the 1920’s. Frankie first stops at the Left Bank bookstore Shakespeare & Co., where Frankie meets Sylvia Beach and becomes a member of the expat “clubhouse.” Fun fact in the acknowledgments of the book: in real life, Sylvia Beach was godmother to Caroline Preston’s mother, Sylvia Preston. 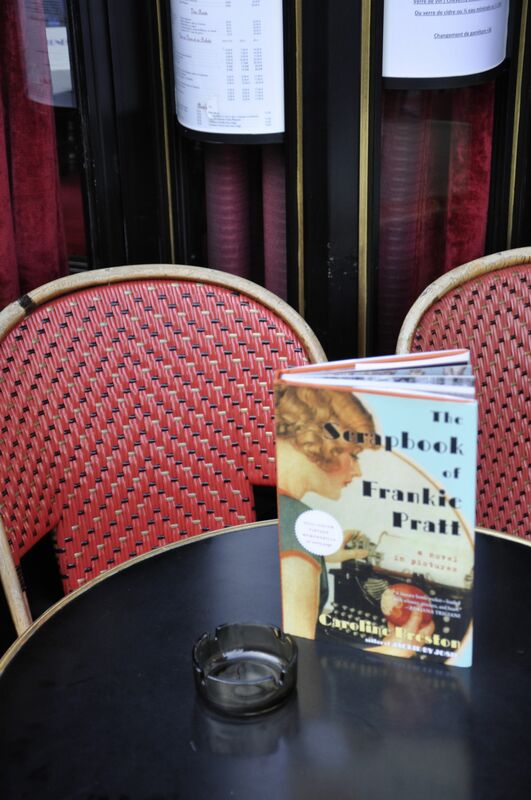 Frankie Pratt breezes through the standard sightseeing highlights of Paris and then heads down to the corner of Boulevard Raspail and Boulevard Montparnasse in the heart of the Latin Quarter, as recommended by her guide “Paris With The Lid Lifted.” Frankie sits outside at Le Select, where she orders onion soup and “observes the sideshow.” (p. 162). Frankie strikes up a romance with her editor Jamie, a Lost Generation war veteran who, like most of that generation, or so it seems, likes to hit the Left Bank bars a little too hard. 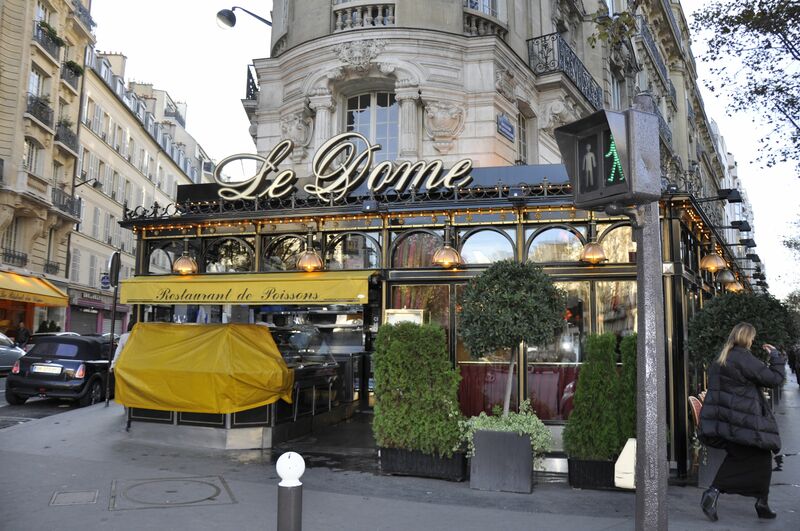 Frankie and Jamie stumble through a series of hot spots in the Left Bank, from Le Dome to La Rotunde on Boulevard Montparnasse (p. 178). I followed their footsteps, but without the booze. Oh, okay, maybe an occasional glass of St. Emillion. There’s so much more to this lovely little graphic novel, including the “inside scoop” on the release of Hemingway’s The Sun Also Rises in 1926. According to Frankie, Jake Barnes is Hemingway “without testicles,” and Lady Brett Ashley is a more charmingly drunk version of the real life Lady Duff Twysden. (p. 187). Even Charles Lindberg makes an appearance when he lands his first Trans-Atlantic flight in Paris in 1927. (p. 191). 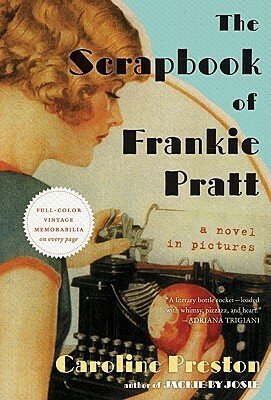 The Scrapbook of Frankie Pratt is not just a clever faux scrapbook; it’s a story of a young woman coming of age in New York and Paris, illustrated with the contents of Preston’s own mother’s scrapbooks and memorabilia. It’s a beautiful tribute to an adventuresome mother and her interesting life and times. I urge you to pick up a copy of this book from your local independent bookstore. And if you’re lucky enough to get to Paris, it’s a great idea for a literary tour of the Left Bank. This entry was posted in Literary History, Literary Site and tagged American Girl Art Club in Paris, Boulevard Raspail, Left Bank Literary Tour, Paris, Paris Literary Tours, Sylvia Beach, The Scrapbook of Frankie Pratt. Caroline Preston by americangirlsartclubinparis. Bookmark the permalink.